Constantine Kalandranis grew up in Astoria, Queens with a love of food. From cooking alongside members of his Greek-American family to preparing for holiday gatherings, Constantine saw the power food had to connect people. After falling in love with the Hudson Valley during college, Constantine returned to the area to open 8 North Broadway with a highly skilled team from the culinary world. 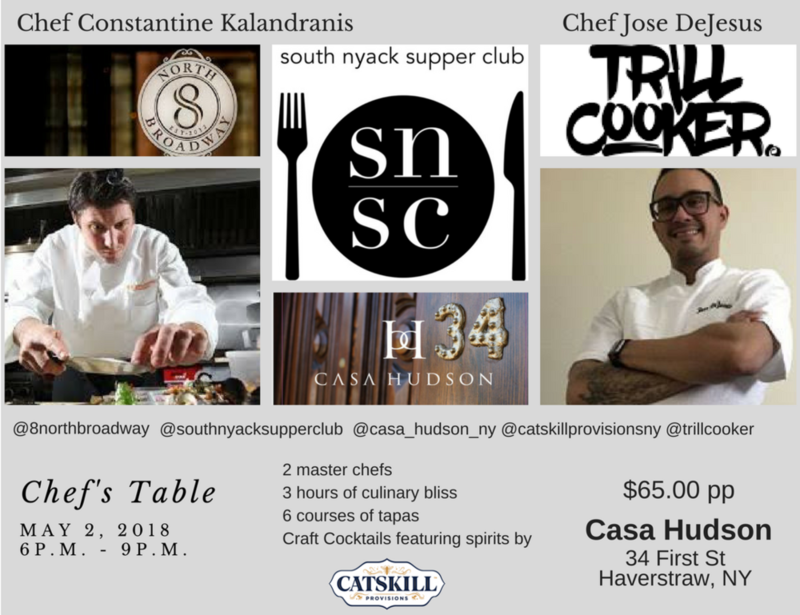 Kalandranis opened two additional Westchester restaurants in 2015, 273 Kitchen in Harrison, and Popojito in Scarsdale. Jose DeJesus, the Trill Cooker, is an ingredient focused, eclectic-international trained chef. Jose designs an exclusive menu for each of his events that is focused around a theme that takes your taste buds on a journey. He makes everything from scratch and uses the freshest ingredients. All his creations and recipes are uniquely put together. Reservations are first come, first serve and seating is limited. Learn to make pasta from the Naples native Papa Cilio. Shapes include orecchiette, ravioli and more. Includes a pasta dinner and a salad. Includes Instruction and a snack. Pizz Making with Papa Cilio. Learn to make pizza dough from this Naples native. The price includes lesson and a pizza dinner and a salad. bring your own wine. Join us for a special night of making pasta with the Cilio's. Learn how to make orecchiette, cavatelli and more. We make the pasta and then we sit and eat the pasta. Bring your favorite wine and enjoy a fun night. $50 includes cooking lesson and dinner. 6 Course Meal with Master Chef Tom Civile. 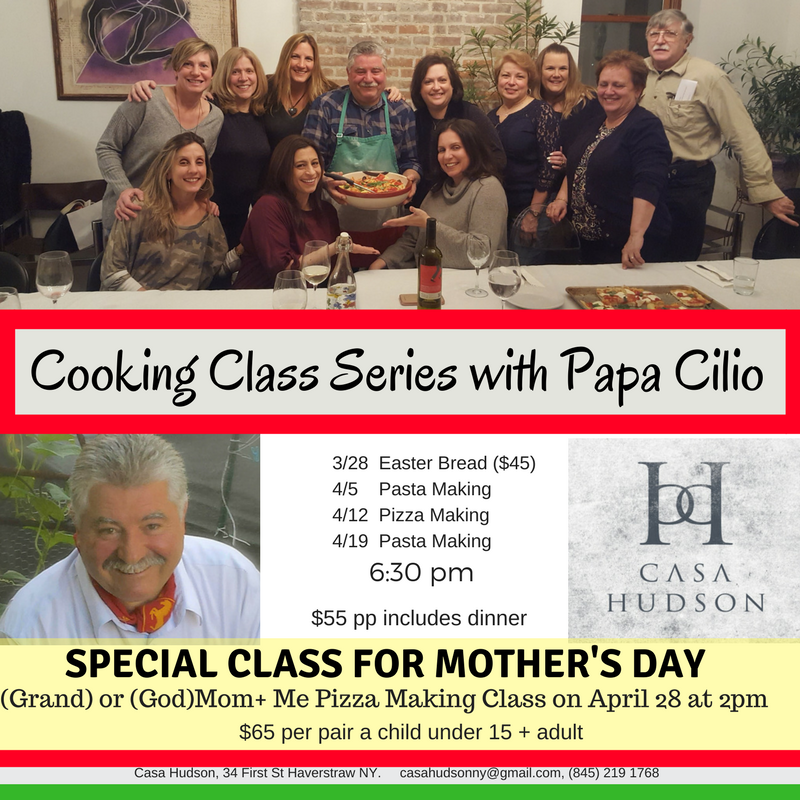 Join the Cilio's at Casa Hudson for a special Friday night pasta making class. Learn how to make the most popular pasta shapes from this native Italian couple's region, which includes cavatelli, orecchiette and more. Includes lesson, and pasta dinner. Join Civile in saying Good Bye to Winter and Hello to Spring in this 6 Course Dinner. Join Us for an evening of fine food, great people,and a wonderful ambiance. Bring your own wine and a hearty appetite. Join Us for an afternoon of fine food, great people,and a wonderful ambiance. It is an Italian Feast, Tom Civile style. It is the last class of the Season. Join us on June 25 for an evening of Italian Small Plates known as “Cicchetti” with Chef Anthony Accomando & Chef Angela Rivera paired with Italian Vino & Birra. A loop of classic iconic film clips from Fellini’s best movies (La Dolce Vida, 8 ½, La Strada) will be shown through the evening. Dine al fresco (weather permitting) or inside and soak up the classic Italian vibes at the magnificent Casa Hudson with gorgeous river views. Dress code is black & white cocktail attire or your favorite Fellini Character. There will be a cash bar to purchase drinks where you can pay via cash, credit or debit.